Is gentrification the “fifth great migration,” that will fill old downtowns with upper-middle-class white folks, while the tract mansions of the outer ring become slums for immigrants? So suggests Alan Ehrenhalt, the former executive editor of Governing magazine. In The Great Inversion and the Future of the American City, he proposes that a demographic shift is under way that is reversing generations of suburbanization and white flight. As corroboration of this vision of the future, he notes the undeniable fact that the ’burbs have not been lily white for decades. Their good jobs, good schools, property values, and low crime rates continue to attract great numbers of hard-working, middle-class Africa Americans and immigrants. Meanwhile, as some inner-city neighborhoods become safer, they are drawing the market segment that developers refer to as “the risk oblivious.” Often, these are intrepid young white people without school-age children who recognize that it was always nuts to ignore the marvelous real estate near the old downtowns. Frequently, they are followed by the somewhat less adventurous and more affluent. For those of us who have long admired Ehrenhalt’s astuteness, however, this book’s theme is undercut by some real head scratchers: His “great inversion” thesis isn’t supported by the 2010 Census data, the location of high paying white-collar jobs, or the rise of the Internet as a social and economic force. The old real estate mantra “location, location, location” applies to American jobs, too. If you imagined the map of the Washington, D.C., metropolitan area as a waiter’s tray, with each white-collar job assigned the same weight, you’d discover that the balance point was just east of the “edge city” of Tysons Corner in Fairfax County, Virginia. New residential areas such as wealthy Loudoun County, Virginia, are booming because of their proximity to concentrations of high-paying jobs around Dulles International Airport, Reston, Fair Oaks, and Tysons. People living in these areas can go years without visiting the District of Columbia, much less commuting to it. Because the Internet is, in effect, a transportation device, it is transforming the built environment. There are nearly 100 classes of real estate—including grocery stores, warehouses, and offices—from which cities are built, noted the late urban theorist William J. Mitchell of MIT. All are being transfigured more swiftly and dramatically than they were by the rise of the automobile. In addition, the Internet is, counterintuitively, putting a new value on face-to-face contact. This has led to the rise of village-like places where people can easily meet. Some are embedded in old downtowns—the sort of places Ehrenhalt cites, such as Chicago’s University Village. Some are part of what traditionally have been regarded as suburbs. But the fastest-growing segment consists of places such as Santa Fe, New Mexico. Home to a world-renowned opera, charming architecture, distinguished restaurants, quirky bookstores, sensational desert and mountain vistas, and a great deal of diversity, Santa Fe, with a population of 68,000, is also little more than a village, far from the nearest metropolis. It represents aggregation and dispersal. If and when real estate begins to increase in value, it may be instructive to look at the metropolitan areas that were appreciating fastest before the recent crash. Number one was Wenatchee, Washington. On the dry, east side of the Cascade Range, it has lots of sunshine, great skiing, and beautiful views, and thus attracted a lot of hip people who brought with them the arts, cafés and restaurants, and increased educational opportunities. Then came the Seattle-area software people, who extended their outdoorsy weekends using cell phones and laptops to stay in touch with the office, eventually moving there and starting their own businesses. Almost the entire top-20 list of fast appreciating metro areas similarly became urbane without really becoming urban. Ehrenhalt is absolutely correct that “we are moving toward a society in which millions of people with substantial earning power or ample savings will have the option of living wherever they want.” Whether that choice will amount to a great inversion, in which the roles of cities and suburbs “will very nearly reverse themselves,” remains to be seen. © 2012 Joel Garreau as first published in The Wilson Quarterly. Submitted by underprice9989 on Fri, 05/17/2013 - 01:50. Submitted by pusatro30 on Wed, 05/15/2013 - 01:38. Submitted by siya23 on Fri, 03/20/2015 - 03:09. Submitted by Peter Walton on Fri, 11/07/2014 - 12:12. Ehrenhalt shows us how the commercial canyons of lower Manhattan are becoming residential neighborhoods, and how mass transit has revitalized inner-city communities in Chicago and Brooklyn. 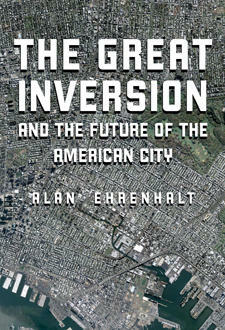 The Great Inversion is an eye-opening and thoroughly engaging look at our urban society and its future. Submitted by hyde_larc on Mon, 04/29/2013 - 23:57. Submitted by hyde_larc on Tue, 04/30/2013 - 01:18. Submitted by jeremyjanson on Sat, 04/28/2012 - 14:34. A lot of the decay of big cities, even with their "location," may come from inner city "tax-and-spend"/"control people" politics, which also drives out businesses. This is where demographics comes in - the group most moving in to big cities is young bachelors, and the group of people most LEAVING the Democrat Party is... young bachelors. 4 years ago, 66% of people 18-30 voted for Obama, 10% over the national average. Today, that same age group has an approval rating of Obama in the 30's, more then ten percent less then the national average. Their two reasons for leaving: economics and economic rights. Meanwhile, older people may actually be becoming more liberal. Combine this with the poor leaving the big cities for smaller cities and suburbs where they can afford to live and get better schools for their children, and you have the perfect political storm. It may be at some point in the future big cities flip politically, and reform themselves massively. Among other things, look to the "risk-averse" to start buying guns and insisting on laws that allow them to use them, and start seeing "we don't dial 911" with two revolvers crossed above apartment windows. Start seeing urban entrepeneurship translate to politics that favor entrepreneurship, while the suburbs become more and more interested in government control to preserve themselves. Massive well-developed but abandoned run down neighborhoods may become centers of commerce and industry as regulation after regulation is peeled away. This will especially happen in those metro areas that are overall doing well economically, and therefore actually have yuppies moving in. Submitted by jamuboro on Fri, 12/28/2012 - 03:29. Submitted by neutronstar on Fri, 02/15/2013 - 09:52. Submitted by hdc77494 on Fri, 04/27/2012 - 11:39. This essay appears to ignore the explosive growth in remote workers. My wife's employer for example, has 12,000 of their global staff of 17,000 working from home. Large numbers of people are no longer required to choose housing based on commute distance, and are choosing based on cost of living, taxes, quality of schools, etc. Cities adopting high density policies that artifically raise housing costs, force people from their cars, or have uncompetitive educational resources may actually see their populations shrink as these people migrate to cities who adopt their constituent's values rather than dictate to them or attempt to manipulate them. How much has this trend contributed to California's documented middle class outmigration?